No nation in history has left the world such a heritage as the Greeks. It seems scarcely credible that so sparse a people, settled on the rocky islands and peninsulas of the Aegean Sea, could have accomplished so much; but they excelled and whatever they set their hands to, warfare or politics, art or athletics, literature or philosophy. They added a new dimension to the human spirit: their ideals, their heroes have become our own. This book begins more than four thousand years ago when semi-civilized tribes from the Balkan Peninsula came into contact with the high culture of ancient Minoan Crete and embarked on the great adventure that was to send Greek armies on campaigns from the pillars of Hercules to the Himalayas and put Greek rules on the thrones of Persia, Egypt, and Sicily; an adventure that was to make Athens the very symbol of civilization and Sparta of selfless heroism. The triumphant climax came in the Golden Age of Athens; but that is far from the end of the story, for Greece continued as tutor to the Roman Empire and finally, at Constantinople, as the last preserver of the Ancient World. Not until 1453 was that great center of wisdom and learning finally destroyed. Rich in detail and bold in its sense of the sweep of history, this book can’t help but infect the reader with the author’s own enthusiasm and admiration for the glory that was Greece. There is no doubt but that of all of Asimov’s non-fiction, my second favorite group are the histories he wrote for Houghton-Mifflin, and of all his histories, this is one of my very favorites (only rivaled by his histories of Rome). It is a readable and clear introduction to Greek history, with a strong focus on ancient Greece prior to the Hellenistic age, and I actually had a college professor who unabashedly recommended it to his students. Asimov is an excellent storyteller, after all, and here he has a story full of drama and excitement that has the advantage of having actually happened. He does a good job of it—ancient Greece comes vividly alive, and we experience the drama of Marathon, of Thermopylae, of Alexander weeping on the banks of the Indus. The book has weaknesses, of course. Coverage of events after about 300 B.C. is spotty indeed—we breeze through the histories of Ptolemaic Egypt and the Seleucid Empire in a few pages. 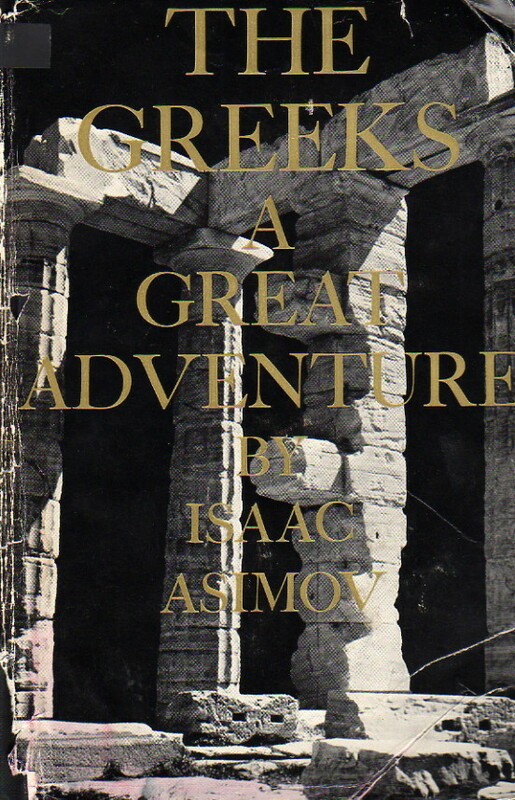 And Asimov does focus on the drama of the story—this isn’t a history of Greek society, Greek art, or even Greek thought to any particular degree. For a fuller account of ancient history, one is perhaps better off turning to Michael Grant who writes nearly as well but provides rather better coverage. Still, I wouldn’t hesitate to recommend this book to anybody who wants a first introduction to Greek history. Somebody already familiar with Greek history in broad terms who wants to know more might perhaps go elsewhere—but I cannot think of a better way to fall in love with ancient Greece than to read this book.